Shardae is Anishinaabe and member of the Red Rock Indian Band in Northwestern, Ontario. She grew up in the neighbouring town of Dorion, Ontario. Residing in this rural setting has ingrained Shardae with an appreciation of nature and has made her an avid outdoorswoman. After gaining first-hand knowledge of the inequities facing northern First Nation communities while working for Health Canada’s First Nations and Inuit Health Benefits Program, Shardae decided to attend law school so that she could aid in addressing these outcomes. 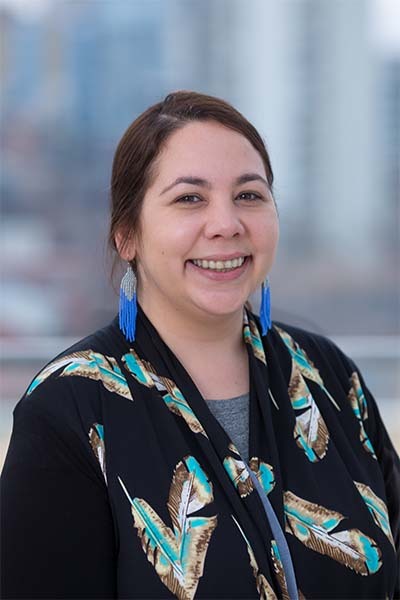 While pursuing this degree she did not waver in her goal; she participated in the in the Kawaskimhon National Aboriginal Moot, a clinic externship with Aboriginal Legal Services, was Co-Editor-In-Chief of the Indigenous Law Journal and a summer Callwood Fellow in Aboriginal Law. As a fellow, and as an articling student in the firm that represents Nishnawbe Aski Nation, she participated in the Inquest into seven Aboriginal students who died in Thunder Bay after having to leave their communities to attend high school, fuelling her commitment to reduce educational inequality between First Nations and non-First Nations communities. Shardae is a member of the Law Society of Upper Canada (Ontario). She has completed a Juris Doctor from the University of Toronto Faculty of Law, earning the Certificate in Aboriginal Legal Studies. She also completed an Honours Bachelor of Arts in psychology and a minor in business from Carleton University.